Teeming with young energy and classically American style, Atlanta is an exciting locale for your engagement photography session. The couple whose love story began in this beguiling city will appreciate the wealth of options for the photography that will celebrate and preserve this momentous step as they embark on their shared life. You will begin your engagement photo session in the rustic setting of Stone Mountain Park, a wilderness haven just beyond the immediate boundaries of Atlanta’s city center. A treasured favorite of busy Atlantians, Stone Mountain Park provides the beauty and tranquility ideal for beginning your photography session. Bring your photographer on the scenic Nature Garden Trail, a pleasant ¾ mile loop that meanders through a hickory forest and offers many private photo opportunities. Capture the stillness of the forest and the profusion of native plants in your photos as you pose beneath arching trees. For a more dramatic, elevated view, take the 1.3 mile Walk Up Trail to reach the top of Stone Mountain itself. Though a slightly more involved adventure than the Nature Garden Trail, the panoramic view from the top will reward your commitment and bring breathtaking perspective to your photography. (Make sure to plan your engagement photo session for a rain-free day to find Stone Mountain Park at its best!) Once you have arrived, have your photographer arrange several poses with the sweeping views and gorgeous skyline as backdrop. Descend from Stone Mountain to explore the next stop along your engagement session itinerary, the old Grist Mill at Stone Mountain. The rustic appeal of the mill, together with the soothing image of moving water and abundant foliage, lend a timeless quality to your photography. Start with a few solitary poses atop the scattered stepping stones crossing peaceful falling water in small falls. These staggered stones are the perfect way to capture intimate photos of the engaged couple isolated amidst water with resplendent greenery beyond. Move next to the old mill itself and pause for a few pictures with the quaint wooden water wheel as your background. Stone steps leading up to the mill’s central structure provide a beautiful stopping point for photos. Pose with your loved one on the alternating stone steps, enclosed by stone walls that heighten the vintage feel of the setting. Cross the old wooden bridge for tranquil vantage points of calm water and rustic surroundings. Alternating slatted wood boards of the bridge offer intriguing lighting possibilities and unique photography perspective. Stone Mountain Park provides an idyllic haven from the bustle of city life; engaged couples may consider holding their wedding on the grounds. Both the Henry W. Grady Riverboat and The Formal Garden offer stunning ceremony and reception locales for the couple who falls in love with the park during their engagement photography session. Your itinerary will now change the flavor of your photography dramatically as you travel into the center of downtown Atlanta for a decidedly metropolitan effect. The High Museum of Art is your next setting. Located on Peachtree Northeast in the heart of Atlanta, the museum provides the perfect blend of modernity and beauty your desire for your photography. The immaculate white facade of the museum offers a truly unique backdrop for your photos. Have your photographer arrange several initial poses on the grassy knoll fronting the museum’s distinctive entrance. The alternating angles of the building’s architecture will lend an emergent artistic edge to your photography while firmly rooting your engagement in Atlanta. After a few shots with the engaged couple in the foreground, move into the museum’s lofty lobby. Capture a few poses here, making sure to take advantage of the light provided by the vaulted structure. While still in the heart of the city, journey south of the art museum for an exciting change of pace. 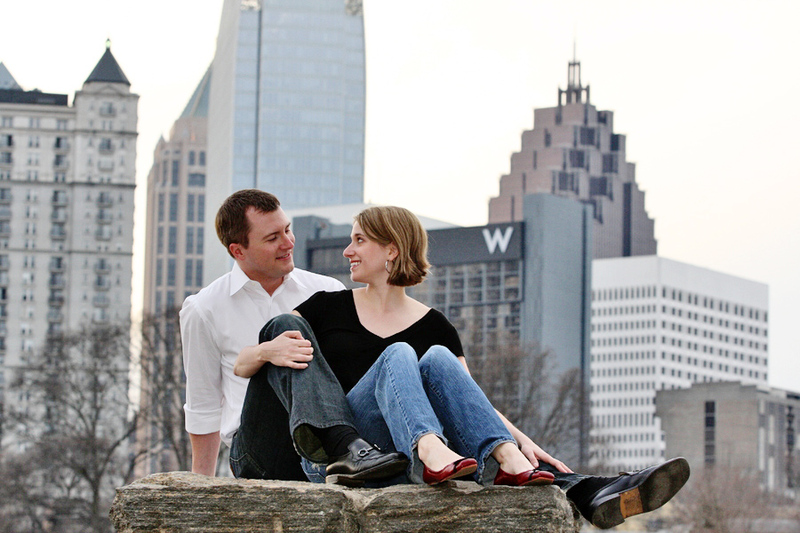 The next stop along your engagement photo session itinerary will bring you to a classic Atlanta location, Turner Field. Home to the Atlanta Braves, this iconic stadium is a landmark for city and a favorite among sports enthusiasts. Follow your more serious, dramatic poses at the High Museum and Stone Mountain with some playful photos at Turner Field. Have your photographer stage your first few poses with the stadium’s entrance as the backdrop. With the classic brick architecture eclipsing the two of you in the photo’s foreground, your engagement photos are sure to capture the romantic whimsy you desire. After a few shots with the stadium at a distance, move closer to the main entrance to pose beneath the sapphire blue awnings that signal the popular ticket windows. Take advantage of the energy that only sports brings and infuse your photos with the capricious fun you share as a couple. After a several arranged shots, let your photographer capture a few impromptu photos as you and your loved one strike spontaneous poses. Climb around the oversized number 44 directly in front of the central ticket window, allowing your photographer to snap pictures that encompass the awning as well as the Turner Field title rising far above. Bring your engagement photo session to a close with a few lingering poses capturing a private moment between you and your loved one.